Combe Martin's harbour is a sheltered venue that provides a wide range of fishing opportunities. Low tide reveals a sandy beach flanked by rocks, while a rocky breakwater divides the high and low water lines and gives a platform to cast a line for a short portion of the tide. The tiny River Umber flows into the harbour providing an injection of freshwater that attracts certain species. High water marks give the angler the opportunity to cast on to mixed ground. An inspection at low tide is beneficial. There are three high water marks. The first is Greenhill's, a rocky promontory on the right of the harbour, reached by descending steps that lead from the resort's main car park. Second is the railings that flank the main road and third, the Bottom Deck, a comfortable high water mark but problematic if a large fish is hooked because it is several feet above water level. A drop net is not practical except on very large tides. A wide range of species can be caught from this venue. Bass are often taken with large specimens sometimes encountered. Mullet move into the harbour over high water and can provide good sport, normally from May until November. During the autumn flounders are attracted by the freshwater that flows into the harbour. Pouting are sometimes numerous after dark, along with the occasional conger eel that can exceed 20lb. Other species include wrasse, plaice and pollack. Top baits for bass are mackerel, peeler crabs, lugworms and squid. Harbour rag tempts the flounders and school bass. Use bread flake or fish flesh for mullet. 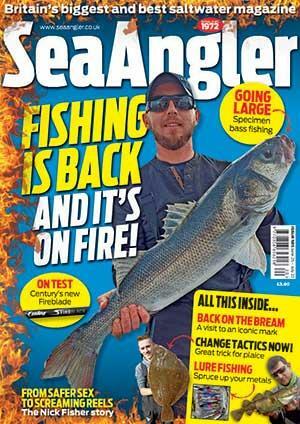 Conger eels are tempted using large fish baits, fresh pouting being particularly effective. A king rag or crab tempts wrasse. The beach can provide great sport in autumn using a light bass rod or carp rod. A simple paternoster rig and 2oz lead cast a short distance will tempt school bass and flounders. For mullet, use a light freshwater float rod, 6lb line, an Avon float and a size 10 hook. Conger eels demand heavier tackle, so use a 100lb trace, size 6/0 hook, pulley rig or running leger with mainline of over 25lb. From the M5 turn off at junction 25 and follow the A361 to South Molton. At Aller Cross, South Molton, follow the signs to Ilfracombe and Combe Martin.